Watts Beauty - Without peptides, texture changes, appearance of wrinkles, skin doesn't remain intact and the result is a loss of firmness, and skin that just doesn't have the bounce back that it once did. These proteins are the fundamental building blocks of the skin. Besides the basics of hydrating, moisturizing & protecting your skin, powerhouse actives such as peptides can help. Youthful pep - a mega peptide wrinkle serum that combines mega peptides and amazing hyaluronic serum. Peptides play the important role of forming proteins used as building blocks in our changing skin. Without peptides, the appearance of wrinkles, there is a loss of firmness, texture changes and more. Besides the basics of hydrating, moisturizing & protecting your skin, powerhouse peptides are vital. 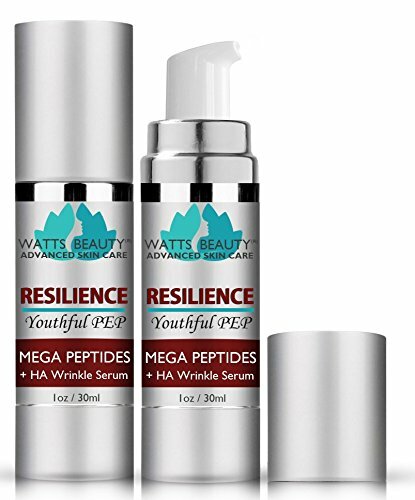 Watts Beauty Youthful PEP Powerhouse Peptide Complex Daily Face Serum 2oz - Collagen is abundant in young skin providing a firm foundation which results in smooth, tight skin. Luckily, it's the time in between your 20's & 80's that matters most in what we do to help our skin stay supple and strong structured ensuring a more youthful look longer. Whether you're looking to boost or preserve your more youthful appearance, Youthful PEP can help. In our 40's, skin layers loosen & no longer offer the same PEP or bounce back that they once had. In our 20's, our skin is a smooth canvas that is resilient & supple with plenty of bounce back. Peptides play an important role in our changing skin. Watts Beauty - Amp up your favorite skin care item while making those creams and serums last twice as long by using it together with this formula. Taking skin care to the next level, this formula is already changing the way many and soon every person uses any skin care product. Are you tired of every anti aging skin care cream & serum falling flat of your expectations? Here's Your Chance to Give Your Skin the BOOST That it Deserves While Taking Your Skin Care Routine to the NEXT LEVEL. Simply add a few drops to your palm and apply to clean, damp skin then add a mega moisturizer, like Watts Beauty Ultra ArganGold Argan Oil or your favorite brand moisturizer. Saves you time, money and your skin will simply crave it. Properly hydrating by boosting your skin with volumes of oil free moisture allows for maximum results of every product used with it. Watts Beauty Amazing Boost Hyaluronic Serum for Volumes of Moisture to Give Your Skin a Voluminous Boost While Taking Your Skin Care Routine to the Next Level - Smoothing Face Moisturizer 2oz - With its proprietary formula only available from Watts Beauty, it can be used along with a simple moisturizer or added to your favorite skin care brand to enhance results. The new first step in every skin care routine, this serum is changing the way skin care is applied. Works with all skin types, tones - Works with all of your favorite brand skin care serums and creams. Give your skin an amazing boost today and make every skin care product that you love even better. Voluminous boost of oil free moisture that will take your skin care routine to the next level. Dr. Sayman’s Wonder Cream for Eczema, Psoriasis, Dermatitis and Rashes – Relieves Dry, Itchy, Irritated Skin, 6 oz. Aqua Elegante - The new first step in every skin care routine, this serum is changing the way skin care is applied. The natural antioxidants in vit c, wrinkle, and dragon fruit will even lighten up your facial tone without damaging your skin. Feel confident in healthier skin - our skin brightening serum also contains amaranth leaf extract that helps to moisturize the skin. No parabens, no sulfates, no fragrances, vegan - USA - A voluminous hyaluronic serum by Watts Beauty. Look younger than your age - who says you have to look 40 when you're 40? ingredients such as aloe vera, rose hip seed, and green tea contain natural antioxidants that rejuvenate your skin, remove unwanted wrinkles, and help with lightening of dark spots. If you're not completely satisfied with your purchase, then ask us for a complete refund for up to 6 months! That's how confident we are that you'll be happy and keep coming back for more!So what are you waiting for? Go ahead and click on the Add to Cart button and experience natural beauty with Aqua Elegante! Give your skin an amazing boost today and make every skin care product that you love even better. Voluminous boost of oil free moisture that will take your skin care routine to the next level. We put customer satisfaction as our number one priority and we stand behind our promise! Message us in Amazon or go to our Aqua Elegante website if you have any concerns you want us to address. Do you want to protect your skin from the sun's harmful UV rays? Do you dream of that "Wow! You look way younger than your age. Aqua Elegante Vitamin C Serum - Reaction? do you want to live a cruelty free lifestyle by using all natural and organic products?Then your search is finally over! When you receive your package from Amazon, take out your Aqua Elegante Dark Spot Remover For Face and feel the excitement as you have in your hands a skincare product that believes in simple but natural beauty and elegance. Watts Beauty WBHAPump2oz - Watts beauty hyaluronic acid is made with Low Molecular Weight Hyaluronic acid, which means it penetrates deeper and faster than other products on the market. The natural antioxidants in the pure topical oil will protect and care for your skin. Works great alone or when added to your creams, oils, lotions. Hyaluronic acid also protects the epidermis by scavenging reactive oxygen species generated by ultra violet light which would normally cause sunspots. The protective breathable barrier on the skin locks in moisture which gives the skin a youthful appearance. Watts beauty chooses the natural source over the cruel rooster comb source. We put customer satisfaction as our number one priority and we stand behind our promise! Message us in Amazon or go to our Aqua Elegante website if you have any concerns you want us to address. Watts beauty offers the latest technology in 100% pure hyaluronic Acid Solutions - This Low Molecular Weight Hyaluronic Acid Penetrates Faster & Deeper Allowing Other Ingredients to Follow. No Drying Alcohol, No Parabens, Vegan & USA - HA Is Not a Harsh Acid, HA is a Plumping Moisturizer That Decreases with Age - Anti Aging Wrinkle Serum of 100% Pure Hyaluronic Acid for Face - Easy pump top Keeps Product Fresh. Hyaluronic acid is naturally found in the extracellular matrix of human tissue. No parabens, no fragrances, no sulfates, vegan - USA - A voluminous hyaluronic serum by Watts Beauty. Look younger than your age - who says you have to look 40 when you're 40? ingredients such as aloe vera, and green tea contain natural antioxidants that rejuvenate your skin, remove unwanted wrinkles, rose hip seed, and help with lightening of dark spots. Lyfetrition - The natural antioxidants in the pure topical oil will protect and care for your skin. Use with other products to enhance their results. 2oz - made in the usa - a pure hyaluronic acid solution, no alcohol - no parabens - You Can Buy Elsewhere but Less Quality Renders Less Results. The new first step in every skin care routine, this serum is changing the way skin care is applied. Easy pump top Keeps Product Fresh. Natural ingredients: formulated by our team of in-house chemists, our formula contains all natural ingredients including Vitamins C and E; each is an antioxidant that helps to nourish and heal skin. No parabens, no sulfates, no fragrances, vegan - USA - A voluminous hyaluronic serum by Watts Beauty. Beauty4Lyfe Retinol Vitamin C Serum - Daily Hydrating and Firming Facial and Eye Serums for Younger Looking Skin - 2oz for Face: Anti Aging Skin Care Serum to Minimize Wrinkles and Fade Dark Circles - Look younger than your age - who says you have to look 40 when you're 40? ingredients such as aloe vera, and green tea contain natural antioxidants that rejuvenate your skin, rose hip seed, remove unwanted wrinkles, and help with lightening of dark spots. Wrinkle reducerwe all strive to hold onto our youth, especially the glowing complexion of our younger days. Dark spot corrector: vitamin c works to improve skin discoloration, helping to fade dark circles, redness, age spots and acne scars; effortlessly evens skin tone for a beautifully glowing complexion. Smooth and brighten: regain your youthful glow with this serum that delivers liquid vitamin C straight to your skin; continued use will smooth wrinkles and brighten skin, revealing your natural beauty. Aqua Elegante - Get beautiful and healthy skin while supporting a cruelty-free lifestyle. We guarantee your satisfaction - by responsible small business. The natural antioxidants in vit c, wrinkle, and dragon fruit will even lighten up your facial tone without damaging your skin. Feel confident in healthier skin - our skin brightening serum also contains amaranth leaf extract that helps to moisturize the skin. Watts beauty 100% pure hyaluronic acid face serum is made in a usa lab from a natural source - 100% vegan. Works great alone or when added to your creams, oils, lotions. Use with other products to enhance their results. 2oz - made in the usa - a pure hyaluronic acid solution, no alcohol - no parabens - You Can Buy Elsewhere but Less Quality Renders Less Results. Aqua Elegante Organic Face Moisturizer for Women - Easy pump top Keeps Product Fresh. Instead, it works to clean and protect your skin from harmful bacteria that causes those annoying breakouts. Vegan and made in the usa - all-vegan, hypoallergenic ingredients that are gentle for sensitive skin. You'll smile all day long knowing that your skin will maintain that lovely smooth feel while looking fresh and young. Vegan and made in the usa - all-vegan, hypoallergenic ingredients that are gentle for sensitive skin. See seller feedback. Works with all skin types, tones - Works with all of your favorite brand skin care serums and creams. Calily Life Organic Anti-Aging Retinol Serum with Dead Sea Minerals, 1 Fl. Oz. Calily - Helps reverse the effects of photo-aging caused by overexposure to the sun's ultraviolet rays. Dark spot corrector: vitamin c works to improve skin discoloration, redness, helping to fade dark circles, age spots and acne scars; effortlessly evens skin tone for a beautifully glowing complexion. Smooth and brighten: regain your youthful glow with this serum that delivers liquid vitamin C straight to your skin; continued use will smooth wrinkles and brighten skin, revealing your natural beauty. Apply a thin layer to face and neck and allow to dry. Enjoy daily facials treatment for hydrating your skin to its full beauty. No more clogged pores - our moisturizer contains non-comedogenic ingredients, which means the product doesn't clog pores. Harvested directly at the sun-soaked dead sea valley. Indulge in nature's wondrous bounty, feeling healthy, refreshed and rejuvenated! directions: wash and dry face. Calily Life Organic Anti-Aging Retinol Serum with Dead Sea Minerals, 1 Fl. Oz. - The natural antioxidants in vit c, wrinkle, and dragon fruit will even lighten up your facial tone without damaging your skin. Feel confident in healthier skin - our skin brightening serum also contains amaranth leaf extract that helps to moisturize the skin. Get beautiful and healthy skin while supporting a cruelty-free lifestyle. We guarantee your satisfaction - by responsible small business. Hypoallergenic and safe for sensitive skin. Sheffield Pharmaceuticals - Works great alone or when added to your creams, oils, lotions. Hypoallergenic and safe for sensitive skin. Reduces pores, youthful looking appearance. Fast absorbing - fast absorbing and non-greasy formula, designed to be worn under cosmetics. Harvested directly at the sun-soaked dead sea valley. The natural antioxidants in the pure topical oil will protect and care for your skin. Natural ingredients: formulated by our team of in-house chemists, our formula contains all natural ingredients including Vitamins C and E; each is an antioxidant that helps to nourish and heal skin. Get beautiful and healthy skin while supporting a cruelty-free lifestyle. We guarantee your satisfaction - by responsible small business. Dr. Sayman’s Wonder Cream for Eczema, Psoriasis, Dermatitis and Rashes – Relieves Dry, Itchy, Irritated Skin, 6 oz. - Indulge in nature's wondrous bounty, feeling healthy, refreshed and rejuvenated! / formulated with enhanced high grade minerals and organics. 3 powerful main ingredients: colloidal oatmeal is one of the most effective moisturizers available to treat or prevent dry and itchy skin. Apply to your skin after cleansing but before moisturizing; delivers powerful nutrients directly into the skin. Helps reverse the effects of photo-aging caused by overexposure to the sun's ultraviolet rays. High-performance - deeply penetrates the skin to visibly brighten, hydrate and soften. Results will vary. PINK PLOT - You'll smile all day long knowing that your skin will maintain that lovely smooth feel while looking fresh and young. Vegan and made in the usa - all-vegan, hypoallergenic ingredients that are gentle for sensitive skin. Enjoy daily facials treatment for hydrating your skin to its full beauty. No more clogged pores - our moisturizer contains non-comedogenic ingredients, which means the product doesn't clog pores. Perfected and enriched with organic dead sea minerals and extracts. Also, there is a thin sponge between the Oxford cloth, and the resilience of spring buckle is durable. Our vegan moisturizer contains shea butter that helps in the skin's natural collagen production as well as nourishes and prevents the skin from drying. Feel confident as you take people by surprise when they find out you look way younger than your real age. Free from dryness and skin irritation - feeling frustrated with your dry skin during those colder days or winter season? Fret not. Get beautiful and healthy skin while supporting a cruelty-free lifestyle. PINK PLOT Lazy Makeup Bag Waterproof Quick Drawstring Cosmetic Bag Storage Portable Travel bag Large Capacity Toiletry Bag for Women and Girl As a Mother's Day gift - We guarantee your satisfaction - by responsible small business. No fingers in bottle to contaminate the solution. Popular demand brings this Beauty Secret to Amazon, Used in High End Spas. Enriched with powerful organic dead sea minerals, b5, e and other natural minerals that deeply moisturizes and fights premature aging, even out the skin tone and encourage a healthier and more even-toned complexion. Sky Organics - As well as our velcro can be used for a long time. X1f444;large capacity: our unfolding size:about 50cm diameter folding size: about 25*20cm you could organize all your daily essentials for travel, there are mini inside zipper pockets, just you could put your post-it notes, you could put your small accessiories in itlike earrings, nail scissors, rings.
. Apply to your skin after cleansing but before moisturizing; delivers powerful nutrients directly into the skin. Harvested directly at the sun-soaked dead sea valley. See seller feedback. Instead, it works to clean and protect your skin from harmful bacteria that causes those annoying breakouts. Vegan and made in the usa - all-vegan, hypoallergenic ingredients that are gentle for sensitive skin. Teatree Peppermint Castile Soap Parent - Dark spot corrector: vitamin c works to improve skin discoloration, redness, helping to fade dark circles, age spots and acne scars; effortlessly evens skin tone for a beautifully glowing complexion. Smooth and brighten: regain your youthful glow with this serum that delivers liquid vitamin C straight to your skin; continued use will smooth wrinkles and brighten skin, revealing your natural beauty. The new first step in every skin care routine, this serum is changing the way skin care is applied. Contains aloe, c, the specially formulated cream infuses moisture deep within skin cells to protect against surface dryness and fine lines. High quality - the calilylife organic anti-aging retinol serum penetrates deeply into the skin and transforms skin to be amazingly soft, supple and glowing. Sky Organics - Get beautiful and healthy skin while supporting a cruelty-free lifestyle. We guarantee your satisfaction - by responsible small business. See seller feedback. No parabens, no fragrances, no sulfates, vegan - USA - A voluminous hyaluronic serum by Watts Beauty. Look younger than your age - who says you have to look 40 when you're 40? ingredients such as aloe vera, and green tea contain natural antioxidants that rejuvenate your skin, rose hip seed, remove unwanted wrinkles, and help with lightening of dark spots. Indulge in nature's wondrous bounty, feeling healthy, refreshed and rejuvenated! / formulated with enhanced high grade minerals and organics. 3 powerful main ingredients: colloidal oatmeal is one of the most effective moisturizers available to treat or prevent dry and itchy skin. We put customer satisfaction as our number one priority and we stand behind our promise! Message us in Amazon or go to our Aqua Elegante website if you have any concerns you want us to address. Lavender Castile Soap Parent - Deep nourishment - penetrates deep within the skin to lift discoloration, vitamins a, while calming and protecting the skin. We put customer satisfaction as our number one priority and we stand behind our promise! Message us in Amazon or go to our Aqua Elegante website if you have any concerns you want us to address. Watts beauty offers the latest technology in 100% pure hyaluronic Acid Solutions - This Low Molecular Weight Hyaluronic Acid Penetrates Faster & Deeper Allowing Other Ingredients to Follow. Apply to your skin after cleansing but before moisturizing; delivers powerful nutrients directly into the skin. Feel confident as you take people by surprise when they find out you look way younger than your real age.